The “Tales” series is very popular in Japan and other countries in the world. There is lots of versions from many consoles, such as Playstation, Gamecube. However, there is a version that never have been released for Gamecube. It is supposed to be a sequel of Tales of Symphonia. Here is a scanned picture from a Brazilian Magazine called “Nintendo World”, which talks about it. NOTE: The magazine never came with more news about Tales of Legendia in the next issues. The game would also connect with Game Boy Advance. Connecting with an another “Tales” game that was not announced on this article. It could probably have E-cards with special items for the game, or use the Game Boy Link to play Multiplayer or something. There is no other informations about this game. In the day August 25, 2005, Tales of Legendia was released for Playstation 2. Thanks to gabrielwoj for making the article, joaowojcikiewicz (for translating the Portuguese article) and KooPako (for helping with grammar) for the contributors! Last updated by U64 Staff & Contributors at 14-08-2011 . Oh wait, 2004 was the year! Actually I believe this “announcement” was a mistake on the part of the magazine itself. You see, back then the “Tales of” series wasn’t much popular outside Japan, specially on Brazil which have even a smaller RPG community than USA. The American publisher renamed “Tales of Eternia” into “Tales of Destiny 2” due to the popularity that Tales of Destiny had in hope to attract consumers, much like the Final Fantasy series (which the games are totally distinct between each other as you guys know pretty well). Tales of Legendia was released for the PS2 in 2005, including a US release and has nothing to do with Symphonia. Visually speaking it was closer to a “Final Fantasy VII-sque” models than ToS. It probably have been a mistake, I couldn’t find anywhere in Google or any other sites. Also, I didn’t know you was here Ultimecia! Too bad all Brazilians, and South Americans in general, do is complain about the English dubs for Tales games and whine on English release trailers that the games need to have dual audio because “Japanese is superior”. Worst case of Wappo sushi disease ever. I believe this is one of those cases of misinformation. 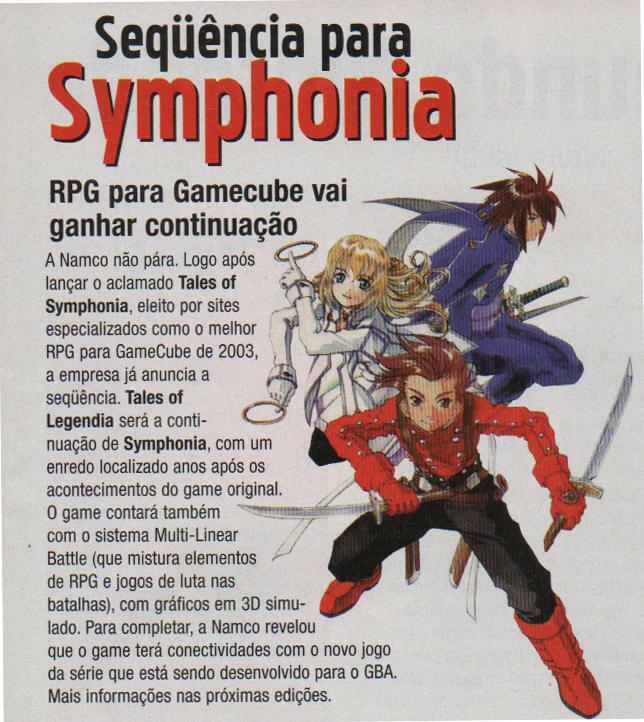 Let’s remember that Tales of Eternia became Tales of Destiny 2 to attract consumers and avoid confusions; so whoever wrote the article thought that Legendia was meant to be Symphonia’s sequel, because it was also named “Tales of”. Am I explaining myself correctly? The GBA game is most likely Tales of the World: Narikiri Dungeon 2, released for GBA on January of 2005. I don’t know where did the “Legendia will connect to the new GBA game” came from. Narikiri 3 wasn’t localized tho.